The Macroeconomics CLEP Prep course will prepare learners to take the College Board CLEP for Principles of Macroeconomics. Economics studies how we allocate resources, which are limited, to satisfy wants and needs, which are unlimited. In fact, the existence of limited resources and unlimited way of using those resources is called the economic problem. This Macroeconomics CLEP Prep course includes interactive audio-visual content, discussions and quizzes to help prepare learners to successfully take the College Board Principles of Macroeconomics CLEP. 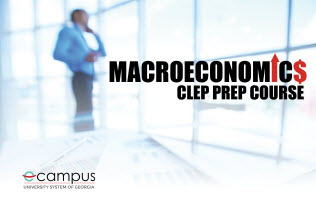 The CLEP covers Macroeconomics content which is typically covered in an undergraduate semester course of Macroeconomics. Students can earn a badge for achieving at least 75% on the Post-Test quiz.